Physics: Geneva, Switzerland. CERN: L-3 Experiment. A technician (K. Reismann) works inside the L3 detector at CERN, the European centre for particle physics near Geneva. 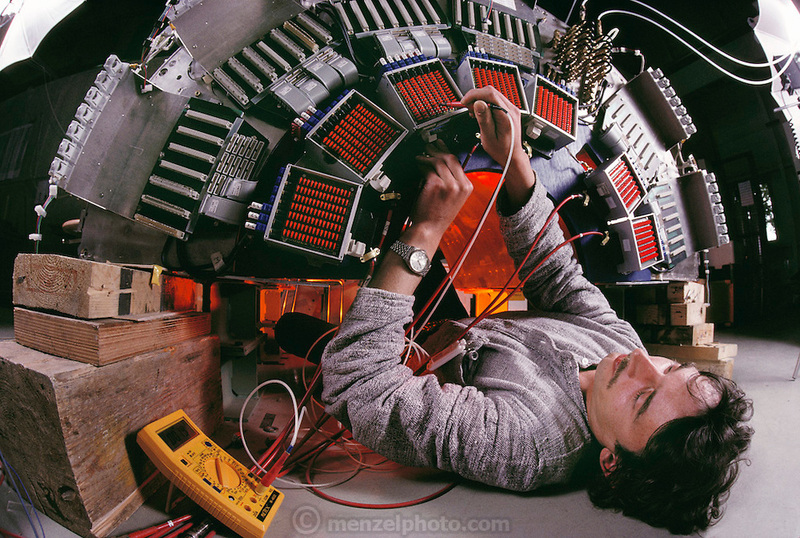 The L-3 experiment is part of CERN's Large Electron- Positron Collider (LEP), inaugurated on 13 November 1989. L3 is one of 4 giant particle detectors at the LEP Collider. LEP collides electrons & positrons accelerated to an energy of 50 GeV in a circular tunnel 100m underground & 27km in circumference. L3 is a cylindrical assembly of many types of apparatus - hadron & electromagnetic calorimeters, drift chambers, & a time projection chamber - which fit together, like layers of an onion around the point where the particles collide. L3 is a collaboration of 460 physicists from institutions in 13 countries. Aachen Group. MODEL RELEASED .